Just in time for snow, the Winterweight OGs are back. 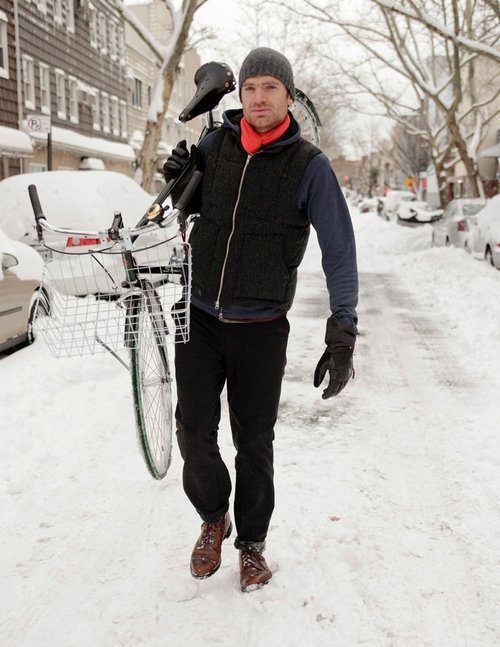 Made in New York City these pants are designed for life both on and off your bike, all winter long. Yeah you’ll see your breath as you cross the bridges and zip past your coworkers trapped in traffic, but you’ll wind up at work feeling great and looking better. The 3XDry treatment is directional. It pushes water in just one direction, away from your body. It wicks away the sweat and moisture, breathes as well as you do, and is seriously water resistant. Most rain, snow or slush just beads up and rolls away. It’s a softshell so eventually it will saturate in intense conditions but when it does get wet, you’ll find yourself dry in 10-20 minutes when safe from the elements. The doubleweave fabric has Cordura woven towards the outside for durability and a soft fleecy interior for a beautiful warmth and comfort. Medium lean in cut. Wear it with a sport coat and oxfords or a hoodie with sneakers. More importantly, wear it without thinking, wear it like a second skin, wear it like a classic that works for any occasion. Fits true to size. Ships early January.